Are you in the market for an envelope that is specific to your industry? Many envelope and shipping companies boast about their products without having the resources and artisanship to create custom made envelopes for their customers. Those looking to add a special touch to their scheduled post can usually only do so by hand, but at Rite Envelope & Graphics, Inc., we can create custom printed business envelopes that will make a powerful statement. From Baltimore to Washington, Philadelphia, and everywhere in between, we provide the highest quality personalized envelopes along the East Coast of the United States. Not only will you be able to order W-2 envelopes for your employees in bulk with us, but you can design ticket envelopes and more with our custom envelope printing services. …And everywhere else throughout the United States. Call us today at 610-981-2373 to speak with one of our staff members about one of our products, services, or pricing. If the exceptional craftsmanship of our custom made envelopes isn’t enough to sway your decision to order with us, then our dedication to sustainably running our company might just do the trick. Having completely green envelopes is one of the main aspects of Rite Envelope & Graphics, Inc. that we take pride in. We are dedicated to preserving our environment and have taken a number of steps to improve our operations and reduce our carbon footprint. This initiative was taken up to contribute to saving the future of our planet. We set forth to updating our prepress department: We now run it completely digitally, direct to plate. This eliminates the use of silver, as well as any film chemistry which produces an excess of chemicals and needlessly wastes valuable resources. Our advanced process contributes to keeping our local communities clean. Additionally, at Rite Envelope & Graphics, Inc., we recycle all of our paper. We also recycle our boxes, printing plates, and other supplies to detract from adding to the problem. 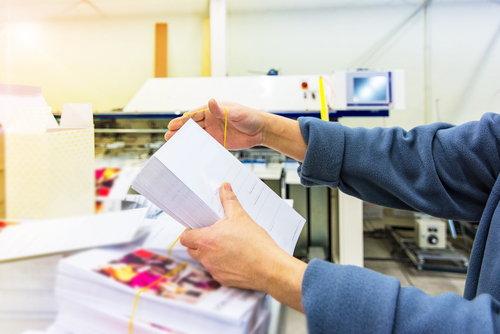 Incredibly, all of our color brochure printing, custom envelope printing, and other printing processes are completed with only vegetable and soy-based ink. 1.) Currency Envelopes – Used for many purposes, these envelopes primarily store cash or coins and come in various styles. They typically have a seal at the back that can enclose currency so it does not become easily misplaced. 2.) Ticket Envelopes – These are typically rectangular in shape and are suitable for tickets of all kinds. Multiple tickets can be enclosed within the envelope via a folding seal. 3.) X-Ray Negative Flat Envelopes – Much larger than the above comparable envelopes, x-ray negative flat envelopes are made specifically to store x-ray negatives and prints for health care facilities. They are sturdy and protect against potentially damaging elements. You can order with us online, or give our staff a call at 610-981-2373 to make inquiries and talk about designs for your custom printed envelopes, brochures, and more today.